The market is on fire right now, which is great if you’re fully invested. But if you have cash on the sidelines, you might be worried about jumping in. And with good reason–with the S&P 500 reaching nosebleed valuations, “safe” indexing is going to expose you to potential losses. There’s an alternative, and it’s particularly compelling because it also nets a high income stream while you wait for your holdings to go up in value. [ad#Google Adsense 336×280-IA]I’m talking about yields of 8% with strong upside in the form of capital gains potential to boot. These big payouts are paid by funds that are undervalued for one simple reason: ignorance. While the market obsesses over mutual funds, ETFs and stocks, they ignore the small but high potential world of closed-end funds (CEFs). It’s a small but increasingly popular world of highly diversified assets that hedge fund investors have been warming up to in the last few months. Even with these billionaires’ cash flowing into the funds, many remain undervalued. But some have gotten rather pricey lately as a result of massive inflows, meaning just any CEF won’t do. Let’s start with three that are too popular and should be sold immediately. Some big yielding funds are big traps. 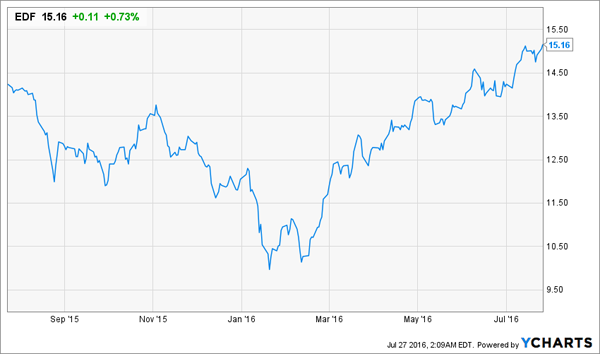 One of the most popular high yielding funds is run by a great company: The Pimco High Income Fund (PHK). While Pimco is a great shop and they have some great value investment vehicles, this is not one of them. When a CEF loses value like this, the market tends to sell it and cause a discount to NAV that, eventually, makes the fund worth buying. 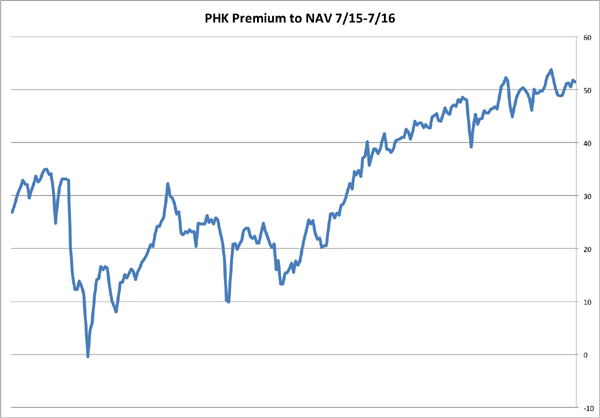 This has not happened with PHK; in fact, as the fund became less valuable, the market has bizarrely given the fund a massive premium to NAV! 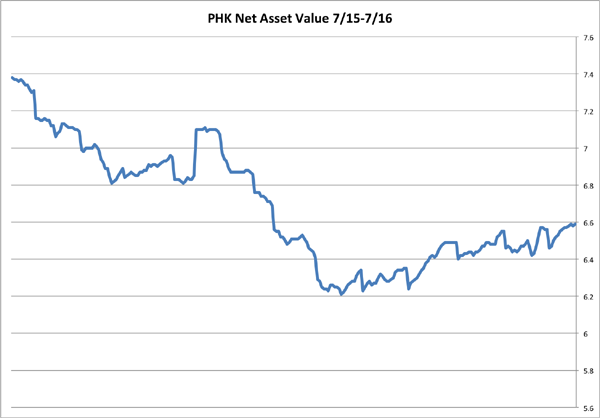 Right now, for every $1 of PHK assets you buy at today’s market prices, you’re actually paying $1.50. Why the huge premium? PHK has sold at a massive premium throughout much of its history, and some traders are surely relying on the “greater fool theory” in hopes of selling it off to a less sophisticated investor who gets caught holding the bag. Others are simply buying because they see a massive yield and don’t understand the risks it entails. Since PHK pays out $1.24 in dividends per share every year but the fund’s NAV per share is $6.59, the fund needs to earn around a 19% return on its investments to sustain payouts. Of course, this is impossible, which is why PHK cut its dividend a year ago and is currently under-earning its distributions by about 3 cents per share. All of this spells danger. Those gains come at a big price that EDF holders are ignoring–or worse, they don’t know about. The fund’s managers charge a lofty 1.82% baseline fee for managing the fund, although management has returned a paltry 2.6% return on NAV since the fund’s inception. That’s not stopping investors from jumping in to get the fund’s 18-cent monthly dividend payment, a 14.2% yield. Even more enticing: the fund has paid those dividends since 2011. But that’s only been at the expense of the fund’s NAV, and its market value has gone down by 38% since 2011, making me leery. Even more worrying: the fund is now trading at the highest premium in over a year, despite usually selling at an average 9% discount. 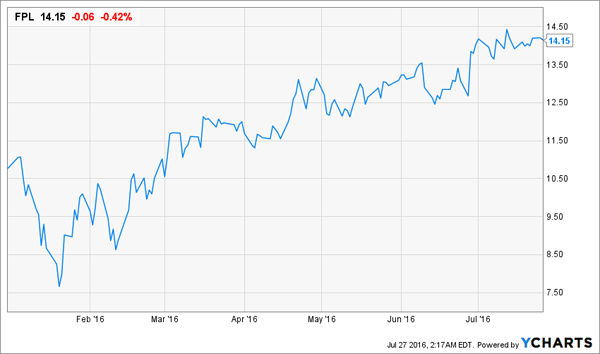 While I see the worst of the MLP and energy crash behind us, that doesn’t mean any MLP fund will do. With FPL’s poor historical performance, 1.5% baseline expenses, and 27% leverage, there is too much risk in buying this fund when it’s trading at a 5.5% premium. Since FPL usually trades at a discount, I would wait to buy this fund until its market price is below its NAV. Until then, I’m much happier with the Alerian MLP ETF (AMLP) or, even better yet, avoiding MLPs altogether. First, the funds are quite diversified–we’ve got U.S. corporate bonds, preferred stocks, REITs and emerging market government bonds. We can buy these three funds, get this excellent diversification and an average portfolio yield of 8.4%. Oh, and did I mention we’re also procuring these funds’ assets at double-digit discounts? Since each is trading at over a 10% discount to the fund’s net asset value, we’re actually saving a dime for every dollar of assets we’re buying. This is one reason why CEFs are so compelling: buying at the right time means we are actually buying assets for less than their real market value. Usually, CEFs are discounted because of management’s historical underperformance or a fear that the fund is mismanaged. But these funds’ total return since inception–about 10% across the board–shows that these funds are actually quite well managed, justifying the admittedly high expense ratios of each. One more thing: because of these funds’ discounts, managers will have an easier time paying out distributions. For example, RNP’s payouts are a 7% yield, but management only needs to earn a 6.3% return on investments to cover those dividends, since the NAV is actually higher than that. In each of these asset classes in current market conditions, management should find it extremely easy to pay those distributions. Another reason to buy right now, before these discount windows close. I’m not the only one dialed in on CEFs. As I mentioned earlier there’s a great deal of big money starting to flood the space – including none other than the “Bond God” Jeffrey Gundlach himself. Did you read his recent take on the sector? If not, click here and I’ll share his analysis – along with 3 more CEFs paying 8% or better, with big upside too, that he’d buy if he could.